Lawyers acting on behalf of undercover police officers have formally asked the Pitchford Inquiry to agree that should their clients’ anonymity be breached or their personal details be revealed at the inquiry then prosecutions should follow. (The above image shows a heading of their joint submission to the Inquiry.) Any breaches of an order could incur charges of contempt of court, leading to possible imprisonment, fines or seizure of assets. Next week the Inquiry will take further submissions before a final decision on whether these threats by the police will be agreed to. The Inquiry will also decide on media reporting restrictions and whether hearings are to be open or closed to both the public and non-state core participants. In short, the police are taking no prisoners: they will do everything in their power to protect all UCOs (undercover officers) and the UCO culture. This is in addition to the severe restrictions sought by the police (see extract in image below). But in his deliberations, Justice Pitchford should remember that the Inquiry he heads would not be taking place if it had not been for the actions of the victims and also of their supporters (e.g. Campaign Against Police Surveillance, Undercover Research, Police Spies Out of Lives and many others) as well as certain sections of the media (notably articles by Rob Evans and Paul Lewis of the Guardian). Indeed, it was due to the tenacity of these people in exposing what had happened that these wrongdoings eventually came to light. Had the victims and their supporters not acted as they did, then those wrongdoings – including a major cover-up of evidence by the CPS – would have continued, as also the cover-up of those wrongdoings. And it was only a week ago that Helen Steel tracked spycop John Dines down to Australia to confront him re his past and current undercover work. 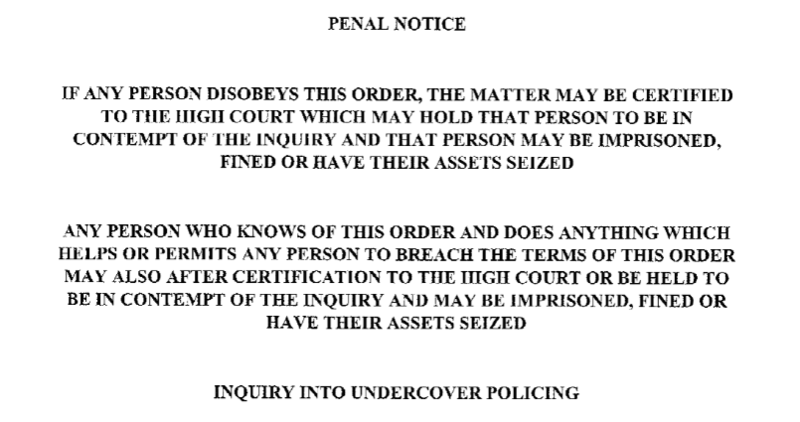 But if the submissions for closed sessions and anonymity by the police are approved by Pitchford, then that would be seen as just another cover-up – not just of the individual cases, but of the entire malpractice that has taken place and approved by senior officers and organised at a systemic level over decades. It is, of course, the responsibility of Justice Pitchford to ensure that the public has full confidence in the credibility of the Inquiry and that full disclosure of the facts and events is allowed, unless, that is, any such disclosure results in further personal distress to the victims. In this respect the wishes of the victims should always come first. If victims – victims who were targeted by spycops for intimate relationships, or victims who were involved in political protests and subject to entrapment to varying degrees, or victims whose families were spied upon merely because they sought social justice – request privacy, then this should be granted. 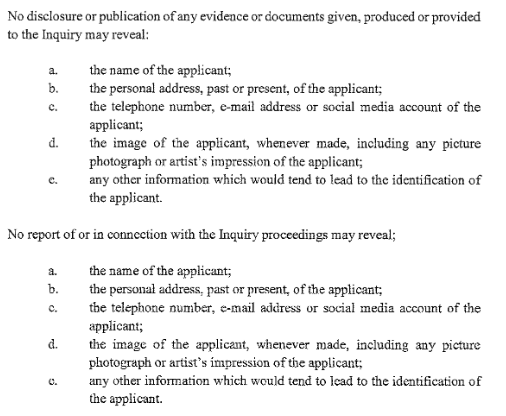 There are several submissions (for example, here and here) by victims who are requesting anonymity, given that some of their revelations may lead to them being blacklisted, or to be targetted by the extreme right. This entry was posted in Intelligence, no category, Surveillance and tagged Pitchford, spycops. Bookmark the permalink. Page not available http://www.ucpi.org.uk/evidence-and-submissions/ for your Information!